WHY WE HAVE AN OPIOID EPIDEMIC? USA NEEDS CONSTRUCTIVE CRITICISM, BECAUSE WE ARE "GOING TO HELL IN A HAND-BASKET" UNLESS WE GET A GRIP ON REALITY SOON. In this writer’s view the opioid epidemic is just another symptom of USA culture rot and moral decay due to liberalism. I wrote in an article recently “What good is it for a nation to gain power and riches but looses its soul and tradition”. Folks, I’m a writer with my own deep views, which very few can stomach. I feel the USA is living on its past glory and history, not on what liberalism is turning this great nation into. I see the liberals trying to turn the USA into a weak p…. feel good political correct socialist state. Sure, love is one of the most important things in our entire human makeup. But, in terms of survival strength, power, discipline, and personal responsibility win the day, things liberals tend to downplay and dismiss to a fault. When raising the young unconditional love that is not balanced with discipline in terms of survival can be one of the most dangerous things there is. No matter what problem exists there can be no lasting solution without discipline playing a role. 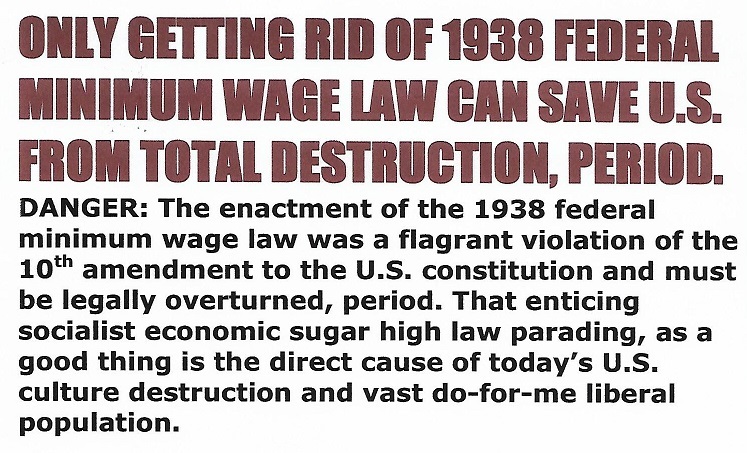 When the Arch-evil 1938 socialist minimum wage law was enacted, that killed the discipline in the USA economy. That was the thing that had maintains societal discipline through the whole nation. With that discipline gone the welfare state set about destroying the strong USA nuclear family system. The main purpose for a nuclear and extended family system in the first place is to instill proper norms and traditions in the very young. That is the only thing that will safeguard and protect the future for any nation. The biggest failure of the welfare state is no one is instilling and enforcing proper norms and traditions in the very young, especially the poor. Now, the parents don’t really know what proper norms and traditions are. The USA can never be saved until that evil 1938 minimum wage law is repealed no matter what any one thinks. F. L. SIRMANS LOG: 27 JULY 2017, 2236 HOURS.